Who is eligible to participate in an international studies program? Participants must be at least 18 years or older and have a valid US passport or the ability to obtain one prior to booking of travel. Participants under age 18 may participate in the program if accompanied by a parent or legal guardian also participating in the program. Study abroad programs are open to both students and community members, however some programs do require concurrent enrollment in specific classes. For example, a program studying in Ireland may require enrollment in a “World Literature” class. Other programs have no class-specific enrollment requirement. See specific program brochure for requirements. How much does an international studies experience cost? The costs associated with an international studies program do vary by country and duration of program. CAC works closely with host country programs to keep expenses at a minimum. Students are responsible for program fee, airfare, tuition and incidental expenses. See specific program brochure for a break-down of fees. It is important to know that all program fees must be paid prior to start of program. Financial aid may be used toward program fees and some scholarships are available for international study programs. Generally, yes, financial aid, such as Pell grants, can be used to offset program costs. The educational institution enters into a written arrangement with a foreign institution, or an organization acting on behalf of a foreign institution, under which the foreign institution provides part of the educational program of students enrolled in the eligible institution. Students qualifying for work-study cannot utilize that award during their time abroad. Undergraduate students who wish to include the cost of airfare or other extraordinary expenses in the cost of attendance budgeted for loan application purposes may do so via direct appeal to the CAC Financial Aid Office. Students who anticipate receiving a refund should make arrangements for electronic deposit of said refund while abroad. Questions on financial aid can be directed to CAC Financial Aid at finaid@centralaz.edu. Many institutions offer scholarships for international studies programs. Please note that many require applications far in advance, so if you think you many want to participate in a study abroad program in the future, apply early and to as many scholarships as you can. Program durations do vary, but most are between 9-12 days in the host country. Occasionally, a program with a longer duration may become available, such as a full semester exchange. Yes. 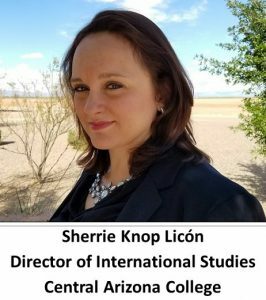 To ensure the safety of our students and staff, Central Arizona College does require all participants in study abroad programs to purchase short-term insurance. Many programs (including those to Mexico and Ireland) will require participants to enroll with iNext (www.iNext.com). This low cost insurance is less than $30 for a 2 week program for participants under 60 years old. CAC will provide assistance with enrollment and iNext will assist with any in-country emergency situations. Do I need any vaccinations to travel abroad? For many countries, especially in North America and Europe, no special vaccinations are required to travel. For some programs, like our semester exchange in China, the host university will supply necessary vaccinations. Will I travel alone or with other students? In most cases, CAC works with a travel agency to arrange flights so that all students and faculty arrive in the host country on the same day and within a certain time window. Other programs require students to arrange flights independently and meet up with the rest of the group in the host country. The International Program staff at CAC will assist in arranging travel, but students are responsible for payment of airfare. Interested in pursuing other study abroad opportunities? This is a 3-week summer program in London, England with multiple academic modules and full immersion into life at a British university. Multiple volunteer & internship opportunities available around the world and on varying schedules. The mission of this organization is to encourage young people to volunteer in developing countries in order to serve, learn, teach and be inspired. Intern opportunities in medicine, law & human rights, journalism, business, and other fields. Award Benefits: Over 2,900 scholarships of up to $5,000 will be awarded this academic year for U.S. citizen undergraduates to study or intern abroad. For more information about the Gilman Scholarship and other helpful resources, please visit www.gilmanscholarship.org. Scholarships Available to study intensive Chinese or Japanese at Washington University in St. Louis. This 7 week course meets for 2 hours per day, 5 days each week with a required 3 to 5 hours of mandatory self-managed study per day. The goal of this program is not to just teach students how to speak and read these languages, but to successfully be able to function in Chinese or Japanese culture. A limited number of scholarships are available to qualified students. Visit www.allex.org for more information.